We recently drove the redesigned 2019 BMW 3 Series in Portugal, and it’s good. The German automaker had the difficult task of conceiving a car that would please its loyal customers that desire the performance-oriented character BMW cars have long been recognized for, but that would also attract buyers away from rival brands. They seemed to have nailed it. The outgoing-generation 3 Series, sold from 2012 to 2018, was considered a little too soft for many BMW purists, although the company sharpened the car’s handling over time and added M Performance accessories on the options list. The last hurrah is the 2018 BMW M3 CS, produced in limited quantities, representing the model line’s most potent variant. As if the 425-horsepower output of the regular M3 wasn’t enough, BMW tweaked the twin-turbo, 3.0-litre inline-six to produce 460 hp and a massive 442 pound-feet of torque. That’s also 10 more ponies than what the 2016 M3 Competition could muster. The M3 CS’ oil sump has been specially crafted to prevent engine starvation on the track, and includes an extra oil suction pump as well. A seven-speed, dual-clutch automated transmission is standard, and gets its own oil cooler, too. A set of ten-spoke, matt-grey alloys is bolted to the car, wrapped in 265/35R19 front and 285/30R20 rear Michelin Pilot Sport Cup 2 rubber. These street-legal tires are extremely soft and grip to dry pavement like glue, but when it rains, they become slipperier than pigs in mud. Buyers can alternately choose Pilot Super Sport tires instead. Stopping power is provided by BMW M compound brakes with four-piston callipers up front and two-piston units at the rear—same as in the regular M3—but for track use, carbon ceramic brakes are optional with two extra calliper pistons at each wheel. All these go-fast parts make for an exhilarating experience on a closed circuit, no doubt. On the open road, however, we obviously have to expect a tiring drive during the daily commute. Configuring the drive modes to the tamest settings—Comfort for suspension and steering, Efficient for the engine, D1 for the transmission—helps a little, though. With all those combinations, it takes a little time to figure out our favourite settings, and once we do, we can save them to the M1 and M2 preset buttons mounted on the steering wheel. For example, M1 could be our desired “soft” configuration and M2 could be our sportiest settings. It’s much quicker than fiddling with all the buttons around the shift lever. As expected, the 2018 BMW M3 CS is wickedly fast. The automaker claims a 0-100 km/h time of 3.9 seconds as well as an electronically limited top speed of 280 km/h. But sheer speed is only part of the M3 CS’ appeal. The specially tuned M performance exhaust uses internal flaps for a meatier sound when the Sport and Sport+ modes are activated, the car belching during every wide-open throttle upshift, popping and hissing at every lift of the throttle. Pretty cool. Not that it really matters, but we recorded a fuel economy average of 11.9 L/100 km during our test. 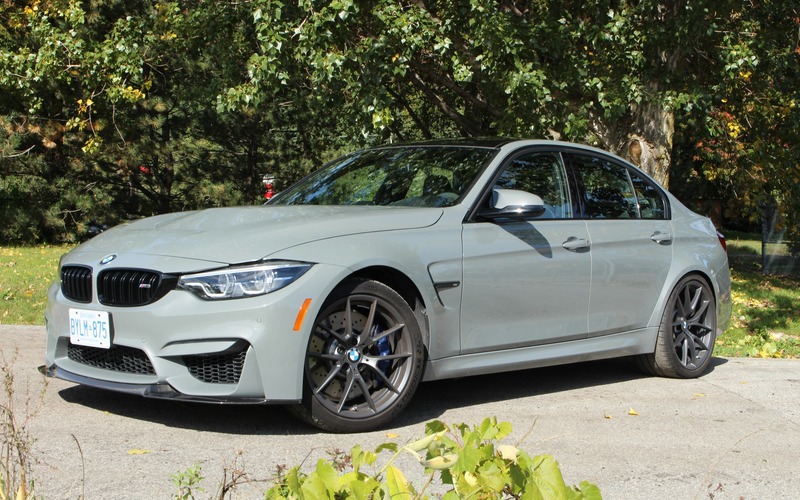 The untrained eye likely won’t spot a CS from a run-of-the-mill M3. The styling cues are limited to a small badge on the trunk and a carbon-fibre spoiler. To keep weight down, the car’s hood and roof are made from carbon-fibre reinforced plastic. 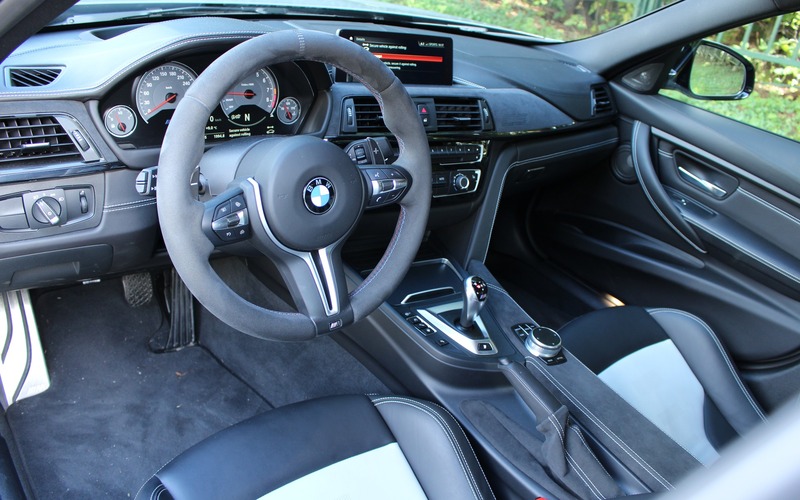 Inside, the Alcantara trim on the dashboard includes hole-punched CS letters, and the rest of the cockpit is dressed in two-tone leather with BMW M striping on the headrests, the seat belts and the steering wheel. The engine start button is red, a further statement that this isn’t an ordinary M3. There’s no centre armrest and the climate system doesn’t have dual-zone controls, but at least there’s heated front seat and a good Harman/Kardon sound system. 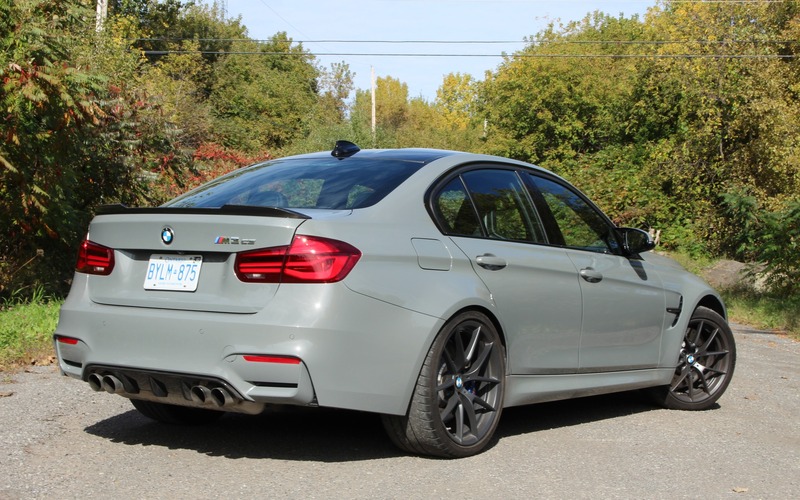 Only 1,200 units of the 2018 BMW M3 CS have been produced for worldwide consumption, and about 50 have reached the Canadian market. They might have all been spoken for as these lines are being written, but there may be one or two left because its high price probably turned off all but the most diehard purists of the brand. In Canada, the CS starts at $113,500 before freight and delivery charges of $2,245. In comparison, a regular M3 with the M DCT gearbox starts at $81,450. It’s fast, it’s loud and it looks downright mean. The M3 CS allows the six-generation 3 Series to go out with a bang with thrilling performance and assured exclusivity. 7/10	Not bad, considering the car’s output and performance potential. 5/10	We have to expect a harsh ride on all but the smoothest roads. Even with the suspension set to Comfort. 9/10	The M3 CS can blast from 0 to 100 km/h in 3.9 seconds. What else needs to be said? 8/10	BMW’s iDrive interface is easy to use, thanks to the slick rotary dial and main menus buttons surrounding it. 10/10	Just an amazing car to drive and to listen to. 9/10	The M3 CS is a track beast that can still feel at home on the open road.